The Q Card Case for iPhone 7 (Q Card Case) is a slim wallet-style case made of soft-touch rubber, with a fabric card/cash pocket that looks and feels like faux leather. Its textured sides make it very grippy to prevent drops, and the full frame bezel raises the screen from touching the surface when you place the phone face down. The camera lens is also protected from scratches by a flash guard. Putting the Q Card Case on my iPhone and removing it is super simple, an important function for me. I don’t like wrestling with a case. My phone snaps into the Q Card Case in a matter of seconds; removal is under ten seconds. 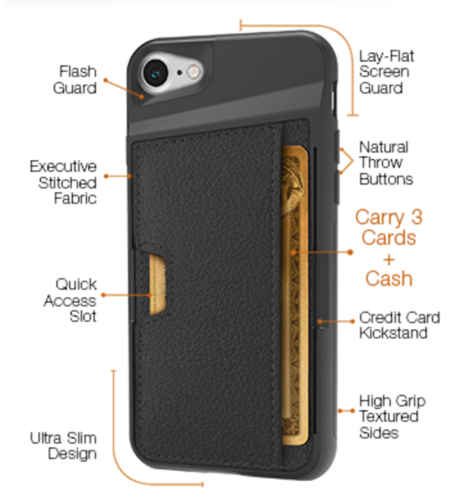 According to the CM4 web site, the Q Card Case hold up to three cards plus cash. At first I found two cards and one folded bill was a tight squeeze. It takes a few days for the fabric pocket to loosen up, and once it does, adding and removing cards and cash was much simpler. Never did I fear that anything would fall out. 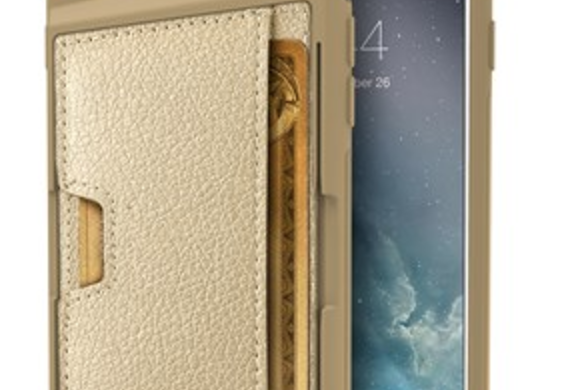 Cards can be pushed out through a slot on the left of the case, or pulled out from the opening on the right. A bonus element of the Q Card Case is the ability to use a credit card as a kickstand to watch videos in two different viewing angles. See the screenshot below (taken from the CM4 web site) to see the back of the case with all its features. The Q Card Case for iPhone 7 comes in four colors: Champagne, Black Onyx, Rose Gold, and Gunmetal Gray. Packaging is elegant, and includes a microfiber cleaning cloth. Currently, if you order directly from CM4 they include a free screen protector. Add the lifetime warranty and you’ve got a case that’s not just functional, but looks and feels great.